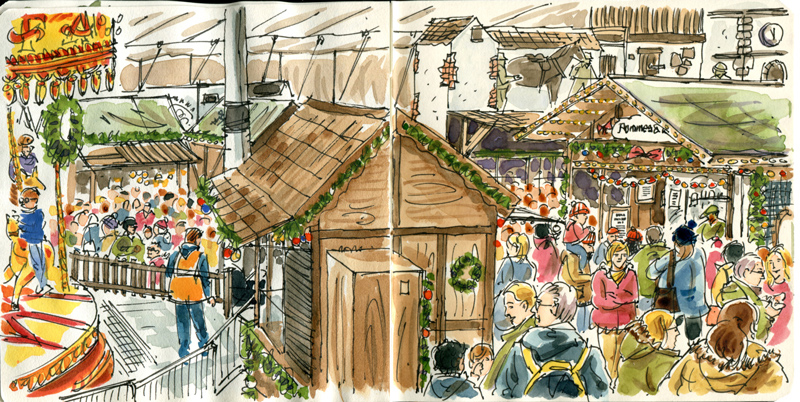 Every year, Leeds – like so many British cities – hosts a German Christmas market. Millennium Square, in front of the imposing Civic Hall, echoes to the sounds of children enjoying the delights of a traditional fairground carousel. The aroma of grilled frankfurters and bratwurst drifts through the crisp winter air. Revellers form a very British queue in front of the very German Beer Hall and families search for that special gift at the many stalls. This year I thought I’d brave the throng and attempt to sketch the market and the crowds. Luckily I found a quiet corner on a terrace overlooking the square. Unfortunately, although I did get the sketch, I didn’t get a chance to enjoy a beer or a bratwurst as I was in desperate need of getting myself somewhere warm to thaw out. What we put ourselves through for a sketch. Joe Bean is a graphic designer and illustrator from Leeds, England. See more of his work at his Flickr site.